In case you were inclined to think that Dickens made up some of the more piteous episodes in his novels . . .
"Maidstone Petty Sessions ~ Sarah Greengrove, a girl about 15 years of age, was charged with stealing 10 turnips, value 4d., the property of Mr. Charles Frederick Baxter. James Smith, a man in the employ of Mr. Baxter, stated that on going into the field yesterday (Thursday) morning, about 6 o’clock, he observed the prisoner pulling turnips; he went up to her, when she dropped them and walked away, but was apprehended in the course of the morning. "The girl denied taking 10, but stated that she had come from Marden that morning, where she had been hopping [i.e., harvesting hops -- KT], and being very hungry and thirsty, went into the field and drew four turnips. "Mr. Ellis [the magistrate] said there was no direct evidence of her having taken 10 turnips, but from her own admission she had taken four under the circumstances stated. It did not appear that she was one of those that had committed depredations there before, and he should leave it for Mr. Baxter to use his own discretion in going any further with the case. "Mr. Baxter said he wished to press the case, as he had lost a great many turnips, and had been subject to several severe depredations lately on his farm. "Mr. Ellis thought this a very different case to that of an old offender. "Mr. Baxter said they had a great difficulty in catching them, and he was determined to make an example of the first one. "Mr. Ellis regretted very much that his appeal to Mr. Baxter had no effect, for he felt extremely sorry to be obliged to send her to prison; but, as Mr. Baxter seemed determined to press the charge, they had no alternative but to do that. She was then sentenced to pay 4d., the value of the turnips, 3s.6d. costs, and 6d. penalty. "Prisoner said she had no money, and was ordered to sit down. "Shortly after, a boy entered the court, crying bitterly, and on going towards the bench said that he had taken his shoes from off his feet and pawned them to pay for his sister. He then gave the money to the magistrate's clerk, Mr. Case, and the girl was discharged. "We understand that the money was refunded to the boy, and he immediately went to redeem his shoes." 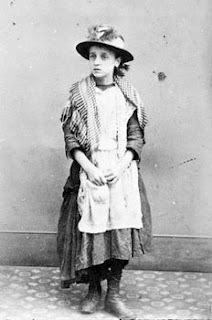 Shown here: Unidentified "Waif Girl," from Hidden Lives Revealed: A Virtual Archive ~ Children in Care, 1881-1918 (this fascinating website features unique archival material about poor and disadvantaged children cared for by The Waifs' and Strays' Society). This girl, and the shoe pawning, could not have been an unusual occurrence! This is a very interesting article. The plight of poor children in the 19th century was so truly appalling. The pauper apprentices (like Oliver Twist) had absolutely no rights whatsoever and were virtually slaves to their masters. I find it all terribly moving. And, of course, Dickens based much of "David Copperfield" on his own experiences in the blacking factory :-(. It is wonderful that the money was refunded, in itself makes me think better of the Victorian Age. See Robert Hughes' "The Fatal Shore" for more about transportation for thefts of food or clothing. The kindness of the magistrate and the ultimate refund are telling. We like to sit in judgment of the past and to label eras as cruel, but human kindness is inevitably evident if you look for it. I think we get pleasure in such judgment simply because it gives us a sense of superiority that we don't really deserve.